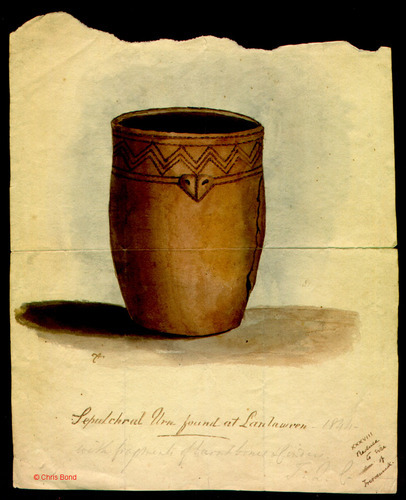 William Copeland Borlase, as an illustration for his 1872 book Nænia Cornubiæ, later sketched Quiller Couch’s painting of the urn, which had been discovered in a barrow at Lanlawren in Lanteglos-by-Fowey. The artist has added in pencil “with fragments of burnt bones & cinders”, and Borlase has written instructions in the lower right hand corner reading “XXXVIII Reduce to size of Tresvennack”, referring to an illustration of the well known urn discovered and disinterred by a farmer a couple of feet to the east of the 11½ feet tall menhir known as the Tresvennack Pillar. The Lanlawren illustration was actually the 39th in the book so Borlase must have added a further illustration prior to the book’s publication. © Chris Bond - Private Collection.